The starting point of Tropicalia was in 1968, with a record of Caetano Veloso (with the opening track "Tropicália"), followed by Gilberto Gil's 2nd album, consolidating with the manifest album "Tropicália ou Panis et Circensis". “Araçá Azul”, de Caetano Veloso, from 1972, is considered by many as the revival and grand Finale of the Tropicalismo. The Tropicália was the gateway to the Brazilian Underground and Counterculture. 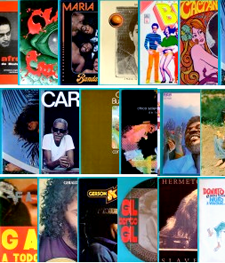 Some artists (from various fields) that represent the Tropicália and the Brazilian Counterculture are: Caetano Veloso, Gilberto Gil, Tom Zé, Os Mutantes, Rogério Duprat, Gal Costa, Rogério Duarte, Torquato Neto, José Carlos Capinan, Hélio Oiticica, Jards Macalé, Glauber Rocha, José Celso Martinez Correa, José Agrippino Paula, Damiano Cozzela, Julio Medaglia, Waly Solomon, Luciano Figueiredo, Oscar Ramos, Rogerio Sganzerla, Helena Ines, Julio Bressane, Ivan Cardoso, Lygia Clark, Luiz Carlos Maciel, Ernesto Bono, Joel Macedo, Jorge Mautner, Chacal etc.